We’re giving away a fashionable, eco-friendly MacBook sleeve from ColcaSac. It’s easy–just follow us on Twitter, retweet the tweet below from Tuesday March 30-Wednesday March 31st, and you’ll be randomly entered to win. * PRIZE: A ColcaSac MacBook sleeve in black. (Total value $39.95)! * TO ENTER: Follow us on Twitter and retweet the giveaway tweet on Tuesday March 30, 2010. * MUST ENTER BY: Wednesday March 31st, 2010 at 5pm EST. * NUMBER OF WINNERS: One. * PRIZE SHIPS: From GoingGreenDC to U.S. address only. * ETC: One entry per person (duplicate entries will be deleted). Winners are selected using random.org. Winner will be contacted via email after contest has ended. Good luck to all! ColcaSac Sleeves are made by hand with all-natural environmentally friendly fabrics such as hemp and jute and lined with soft, 100% polyester sherpa fleece that provides protective padding and is secured with a durable, easily accessible velcro closure. Each sleeve has a pocket that can carry a power adapter, mouse, USB Flash Drives, DVDs, or CDs, etc. One percent of all sales are donated to purchase land in environmentally sensitive areas. Cool! I just followed you on Twitter as LandlockedSailr and RT’d! Thanks for the opportunity! This looks great. I need a cover for my MacBook! Thanks! 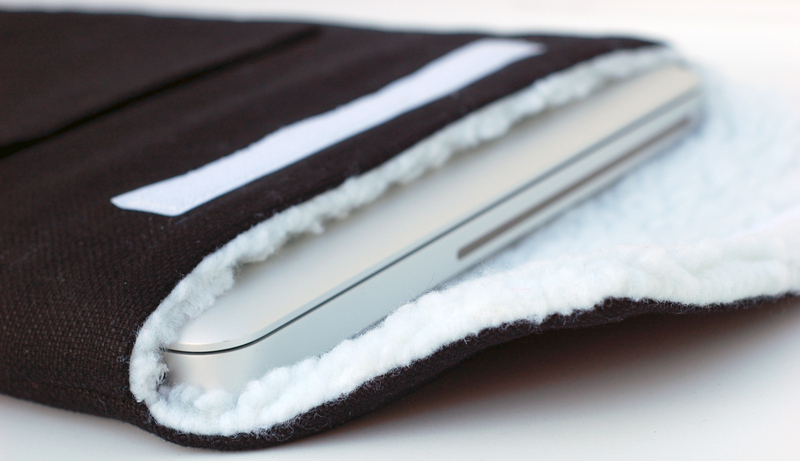 We just wanted to say THANK YOU for the MacBook sleeve by ColcaSac. It’s so nice and our MacBook fits perfect in it!! This was a fun and easy contest to enter! Thanks again for the opportunity. We LOVE IT! The Create The Good Team!